Here I am, Sunday afternoon; which means the grocery shopping for the week is done; the washing machine is on, and I’m scheduling some posts for the week 🙂 I hope your Sunday is going how you want. Friday evening and Saturday afternoon I had a great time with some of my wonderful customers, existing and new, friends and team member – in my Birthday Bash class! I always start off the new year with a birthday card themed class; I find that everyone needs to restock their supply of cards, and I do as well. We had lots of fun using the Balloon Adventures Bundle and the Lift Me Up Bundle – balloons everywhere! 🙂 I thought I’d share a couple of them with you today; if you’re thinking of getting either of these bundles (or both, like I did!) they’re well worth it! 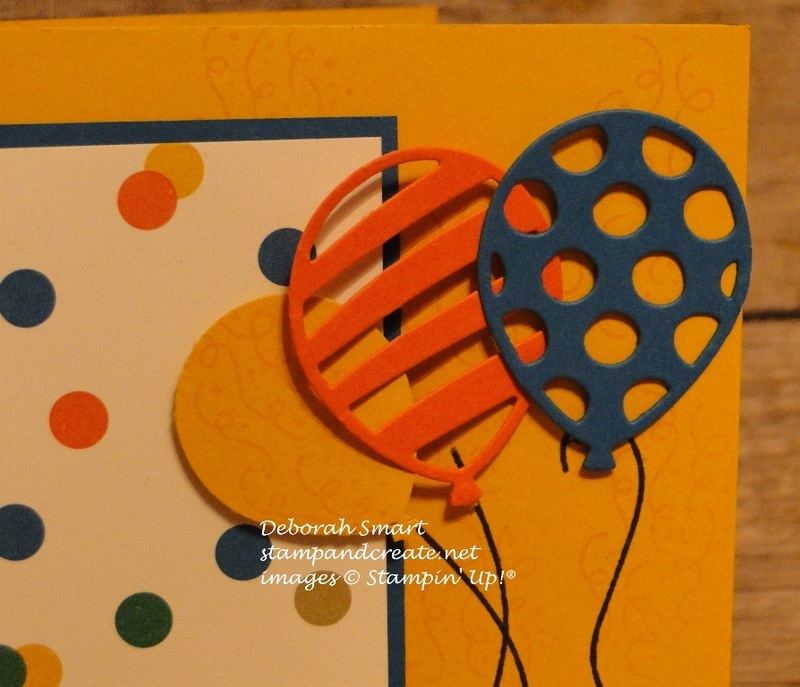 This card uses the Balloon Adventures stamp set and the Balloon Pop-Up Thinlits Dies. The best part of buying the Bundle is that you save 10% – and there’s no fussy cutting! I just love the fun die cut shapes of the balloons! I used Calypso Coral and Pacific Point cardstock for the 2 die cut ones, and I used the Balloon Bouquet Punch for the smaller one in Crushed Curry cardstock. The card base is Crushed Curry cardstock; I thought it was a bit plain, so I used the confetti image stamp, and randomly stamped all over in Crushed Curry ink, just to give it a bit of texture. I did the same on the Crushed Curry balloon. I cut a panel of Pacific Point cardstock, and layered it with a panel of the polka dot pattern paper from the Party Animal Designer Series Paper. After attaching these to the card base, I stamped the balloon strings in Memento black ink, then attached the balloons using Glue Dots. The sentiment was stamped in Pacific Point ink onto Whisper White cardstock; I used the Stitched Shapes Framelits to die cut it and the Crushed Curry oval beneath it, and attached them to the card front with Stampin’ Dimensionals. 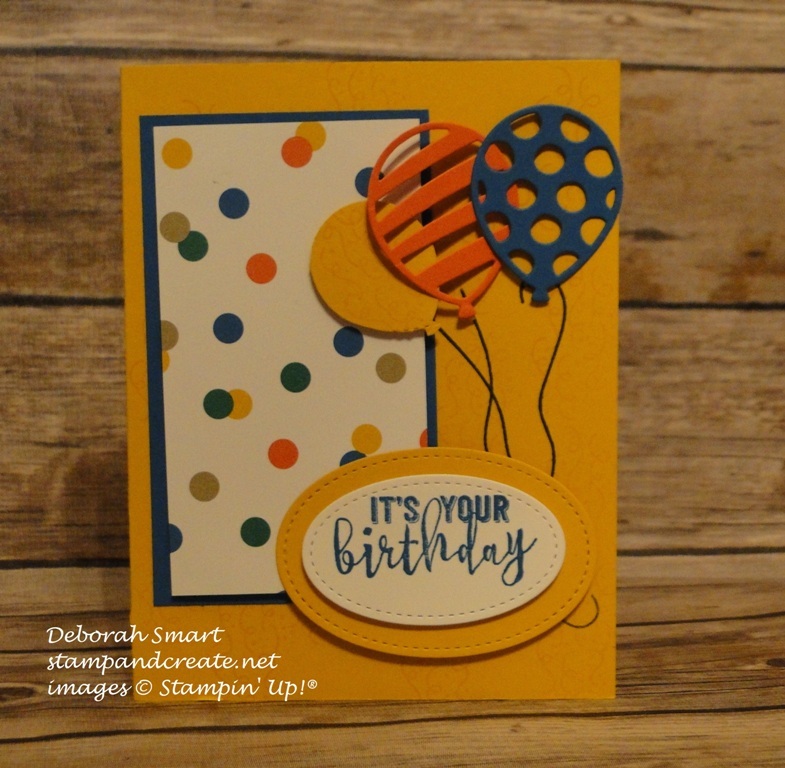 This next card uses the Lift Me Up stamp set and the Up & Away Thinlits Dies; again, you can purchase the Bundle of both these products, and save 10%! Using the colours pulled from the Carried Away Designer Series Paper – that I got for FREE from Sale-A-Bration! – my card base is Mint Macaron, with a panel of Peekaboo Peach cardstock angled on top. Then I offset a piece of the Carried Away DSP on top of that – I like how it looks like an aerial view, looking down from the balloons! I stamped the 2 balloon onto Whisper White cardstock; one in Calypso Coral, the other in Basic Gray ink. 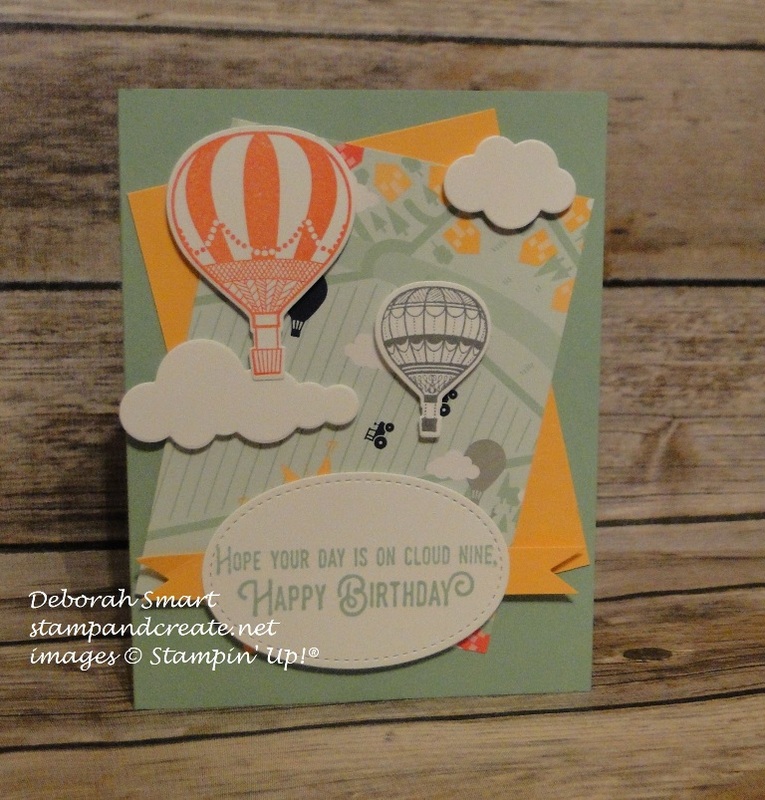 I used the Up & Away Thinlits to die cut the balloons and the clouds, then attached them to the card front using Stampin’ Dimensionals. The sentiment is stamped in Mint Macaron onto Whisper White, and die cut using the Big Shot and the Stitched Shapes Framelits. I really like how the stitching around the edge gives it such a ‘finished’ look, without having to add extra layers. I put a thin strip of Peekaboo Peach cardstock behind the sentiment, sniping banner tails in each end using my Paper Snips. I hope you’ve enjoyed seeing these 2 cards; I’ll share the other 2 tomorrow. I’d love to read what you think about these bundles – please leave a comment, if you have time! To order the supplies I used to create these cards, just click on the images below, and you’ll be taken directly to my online store. Or, just contact me at debsmart@shaw.ca, and I’m happy to place your order for you!